A simple technique for producing very low-density palladium nanofoams could help progress hydrogen storage technologies, reports a new research from the University of California, Davis. A nanofoam is what it sounds like — a foamy variety of some material, filled with very tiny pores. First launched roughly 20 years ago, metallic nanofoams have potential for diverse applications. The porous structures are robust and lightweight — like their natural equivalents of cork and bone. Palladium and some other metal nanofoams can also quickly store and discharge hydrogen, making them a favorable candidate for hydrogen fuel cells. But before cars can begin fueling up via nanofoam, using metallic foams on a mass scale must surpass challenges including contamination, challenging manufacturing conditions and poor crystallinity, said Senior Author Kai Liu, Professor of Physics in the UC Davis College of Letters and Science. It is also tough to accomplish very lightweight foams without sacrificing their stability, Liu observed. Traditional metallic foam manufacturing methods may require high temperature, high pressure and controlled chemical environments. The UC Davis-led team instead depends on a wet chemistry method that is well-matched for industrial applications and versatile for other types of lightweight metal foams as well, Liu said. This opens up a whole new platform for exciting materials explorations. 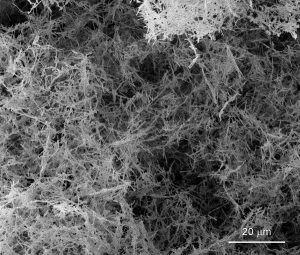 The new method uses palladium nanowires as building blocks. The nanowires are placed in water, and then mixed into a slurry using ultrasonic vibrations. To freeze the wires in place, the slurry is swiftly immersed in liquid nitrogen. To finish, the ice-nanowire mix is put in a vacuum until the ice vaporizes, leaving behind a pure palladium nanowire foam. The density of the material is as low as one-thousandth of the density of palladium in its bulk metal form and can be tweaked for a variety of applications, the team found. The Researchers also examined the hydrogen storage properties of the palladium nanofoam, discovering the material displayed superior rate of absorption and loading capacity. The nanofoam displays outstanding thermodynamic stability, as measured by specialized calorimetric methods at the UC Davis Peter A. Rock Thermochemistry Laboratory. The laboratory is headed by Study Co-author Alexandra Navrotsky, who holds the Edward Roessler Chair in Mathematical and Physical Science. The results were reported online on October 20th, 2017, in the journal Chemistry of Materials. Additional Co-authors include Edward C. Burks, Sergey V. Ushakov, Patricia Abellan, Ilke Arslan and Thomas E. Felter. The research was sponsored by the Department of Defense’s Defense Threat Reduction Agency, the National Science Foundation, the Department of Energy and the Tom and Ginny Cahill Fund for Environmental Physics. The research team is seeking several novel uses for low density metal foams and has filed patent applications for new manufacturing techniques and air filters.